Little Green is ready to rumble. He is a happy, busy little pickup truck who loves helping out on the farm. He wakes up one morning to find a big new blue truck ready to take his place. But can Big Blue take on all the jobs? Even the small and gentle ones? Little Green is ready to rumble again, all the way to the farmers' market. 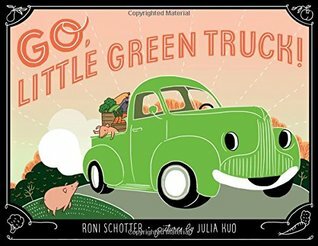 Just like Otis is Otis by Loren Long, Little Green faces a crisis when he is replaced by Big Blue, a bigger, stronger, tougher truck. But like Otis, Little Green too discovers a new place for himself when Fern, the farmer's daughter finds him sitting alone in a field and decides he would make great transportation to the upcoming farmer's market. The old-fashioned feel to the story is sure to bring on bouts of nostalgia for grandparents reading this book to their grandchildren. But the story also rings true for rural areas where small family farms still exist and farmer's markets can still be found. Little Green makes for a cheerful, adorable character that it's easy to cheer for. A book I can recommend for home libraries and school/public libraries like mine that can never have enough truck books. Cornelius Van Wright (www.corneliusvanwright.com) wrote and illustrated When an Alien Meets a Swamp Monster, and has also illustrated several other picture books, including Princess Grace (by Mary Hoffman) and Jingle Dancer (by Cynthia Leitich Smith). His work has appeared on Reading Rainbow and Storytime and has been exhibited with the Society of Illustrators. He lives in New York City. Check out the downloadable CCSS-aligned curriculum guide! Young readers who enjoy pretending to be superheroes are bound to thoroughly enjoy this story. bucky and Stu have pledged to protect their town, the world, and their favorite TV show. 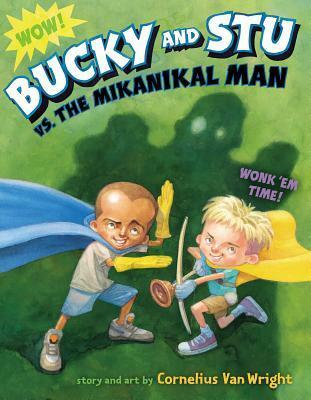 At first fighting 'pretend' garbage bad guys is plenty of good time, but then Bucky introduces Stu to the ultimate "villain' the Mikanikal Man. When the Mikanikal Man comes to life thanks to a zap of lightning, the boys must face their toughest challenge yet. This provides a fun read for young superhero lovers. I even got some laughs out of it. These little boys remind me so much of some boys I know, it's bound to be a favorite. Welcome to Stop #3 on the National Geographic Kids Mastermind Blog Tour! 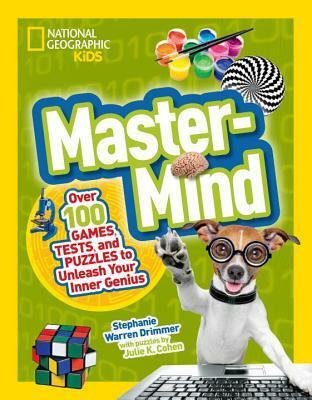 This summer, National Geographic Kids Books is inviting kids to "Unleash Their Inner Genius" with the release of Mastermind (May 2016, ages 8-12). In this fun, interactive book, kids learn what type of thinker they are and are given the chance to exercise different parts of their brains with games, tests and puzzles. Each stop on the National Geographic Kids Mastermind Blog Tour will bring you one step closer to becoming a Certified Mastermind. Be sure to stop by each stop on the tour and challenge yourself to unleash your inner genius with fun quizzes, optical illusions, and brain teasers, and learn tips and tricks for improving brainpower and explanations for the science behind navigating your mental map. Are you ready to test your sense of touch? Check out below and be sure to tweet your results using #Mastermind! 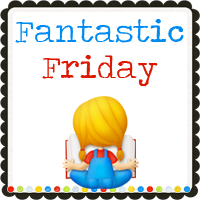 Stop by Mrs. Mommy Book Nerd’s Book Reviews tomorrow for a HERCULEAN puzzler! Over 100 Games, Tests, and Puzzles to Unleash Your Inner Genius! "When I'm finished with you, your brain will be so huge that your average-size neck will no longer be able to support your massive noggin. Ha! I kid. That's only happened once." I really enjoy this kind of book. Not only is this book full of interesting facts (ex. scientists don't agree on how many senses humans have) but there are puzzles and games and tests galore. More than enough to keep young readers engaged for hours. And not only are the readers having a good time, but they are learning too. The book includes the following sections: Vision, Senses, Hearing, Movement, Spatial Reasoning, Language, Memory and Problem-Solving. This is a great book for browsing or reading straight through. A great addition to personal or public libraries. 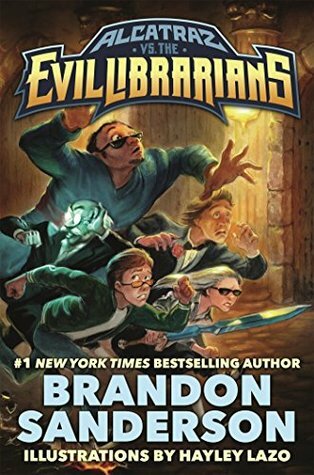 Alcatraz Versus the Evil Librarians is the first adventure in a fantasy series for young readers by the #1 New York Times bestselling author Brandon Sanderson. The fast-paced and funny series is now available in deluxe hardcover editions illustrated by Hayley Lazo. "In this original, hysterical homage to fantasy literature, Sanderson's first novel for youth recalls the best in Artemis Fowl and A Series of Unfortunate Events." Alcatraz turned out to be quite different than I was expecting. The beginning startled me a little bit with the main character (Alcatraz) as the author, telling me that he wasn't a hero and his was a tale of cowardice. I found this rather intriguing of course so I eagerly kept reading. It was clear from the beginning of his story that Alcatraz had a rather distorted view of himself (don't we all?) that came in part from living in so many foster homes. But his talent of breaking things just by touching them and starting a fire and then waiting a few minutes to put it out hooked me and I had to find out why this young man behaved the way he did. The arrival of Grandpa Smedry and Alcatraz's rather startling discovery that what he'd long considered a curse (his breaking ability) was actually a talent similar to talents that many others in his family possessed. Of course, this first meeting with his grandfather takes a turn for the strange when someone turns up and tries to kill him. This sends Alcatraz on a quest he never intended and into a very strange new set of circumstances. I was fascinated by the author's new take on the world. Alcatraz learns that a librarian conspiracy has kept the world in ignorance of what his grandfather calls the Free Kingdoms, continents and countries that don't show up on 'librarian' controlled maps. Having lost something important previous to his grandpa's appearance, Alcatraz and the others are forced to invade the local library at great risk to themselves, and great reluctance on Alcatraz's part. 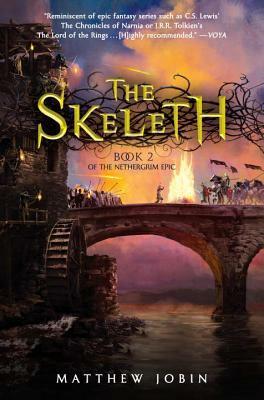 Plenty of fantasy elements come to life here but are mixed with real life in rather bizarre and amusing ways. Alcatraz's asides about the writing profession and the 'tricks' authors use led me to snicker quite often as I read the book. 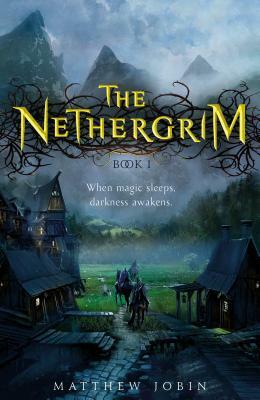 I am definitely going to be reading the rest of the series and recommend that you do as well. These new additions have appealing new covers and interesting (and sometimes false) illustrations. 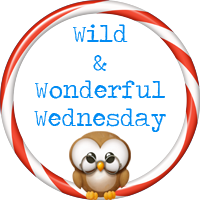 WILD & WONDERFUL WEDNESDAY: Two WILD picture books! Atkinson's boy and bear are adorable protagonists in this homage to the joys of nature and friendship. The boy and the bear start out on parallel journeys, enjoying the woods, creek, and animals near their homes. Preparation is essential for such an exploration and both bear and boy carry what they need with them. After enjoying their journey alone, they bump into each other. At first they are scared of each other, until they realize that they other is an explorer just like himself. They join forces to continue exploring and even take on a mountain. 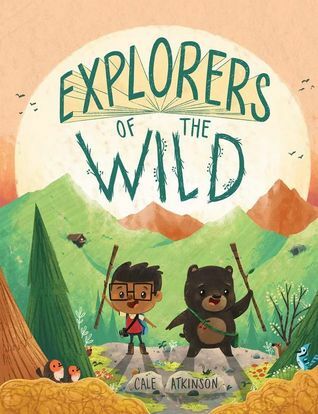 I thoroughly enjoyed the adorable illustrations here as the bear and the boy share their adventures and the beauty of nature. This book is a sweet reminder that life can be full of sweet moments and friendships, and while such moments tend to be fleeting, it's important to experience them to the fullest and keep the memories close. A book that made me smile from beginning to end. 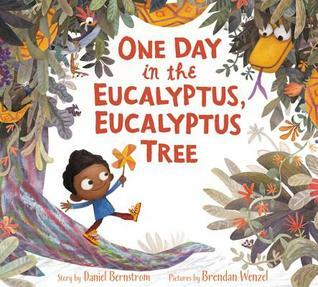 With its striking cast of forest creatures, One Day in the Eucalyptus, Eucalyptus Tree is Daniel Bernstrom’s amusing and original tale of a plucky little boy who is gobbled up by a giant snake. Consuming his victims at an alarming rate, this snake doesn’t realize that his captives are planning their escape. In the spirit of There Was an Old Lady Who Swallowed a Fly by Simms Taback, the reader sees a cutaway of the snake’s belly and can maybe even guess how the tale ends! Classic and contemporary, timeless and fresh, One Day in the Eucalyptus, Eucalyptus Tree has a syncopated and rhythmically delightful text perfect for reading aloud. After reading Betsy Bird's recent review of this book, I knew I had to get my hands on it and share it with my students. So I did. And I was not disappointed in the slightest. The book is a delight both textually and visually. I thoroughly enjoyed reading this text out loud, it has a great rhythm and rhyme to it with word phrases such as crinkle, wrinkle and wiggle-waggle adding vim and vigor to the reading. And of course, the word, eucalyptus as Betsy points out has a rhythm all its own, it was fun to say it over and over again. I think the next time I read it out loud, I'll have the children chime in with me on the 'one day in the eucalyptus, eucalyptus tree' refrain. The illustrations are amusing with the dark pages getting bigger as more creatures join the boy in the snake's stomach. My first graders were thrilled to point out how the snake's belly got bigger and bigger as he ate more and more animals. The book has a trickster feel to it as the boy urges the snake to keep eating. I enjoyed asking my young listeners why they thought he did this, some of them figured out the end object of regurgitation, some said to get him to burp, but they all enjoyed the journey. And the last page definitely elicited a few gasps as the children realized that the story might be repeating itself all too soon and perhaps the eucalyptus tree wasn't the best place to take a nap. A real winner from beginning to end. Did lead pipes cause the fall of the Roman Empire? How many toilets were in the average Egyptian pyramid? How did a knight wearing fifty pounds of armor go to the bathroom? Was poor hygiene the last straw before the French Revolution? Did Thomas Crapper really invent the modern toilet? How do astronauts go in space? History finally comes out of the water-closet in this exploration of how people's need to relieve themselves shaped human development from ancient times to the present. Throughout time, the most successful civilizations were the ones who realized that everyone poops, and they had better figure out how to get rid of it! From the world's first flushing toilet invented by ancient Minoan plumbers to castle moats in the middle ages that used more than just water to repel enemies, Sarah Albee traces human civilization using one revolting yet fascinating theme. A blend of historical photos and humorous illustrations bring the answers to these questions and more to life, plus extra-gross sidebar information adds to the potty humor. This is bathroom reading kids, teachers, librarians, and parents won't be able to put down! Normally, I don't read books about such gross topics but this sounded rather intriguing. And I'm glad I read it, mostly, sometimes ignorance really is bliss. On the other hand, after reading about all the major problems caused by the lack of adequate waste removal, I have a much greater appreciation for modern toilet facilities. 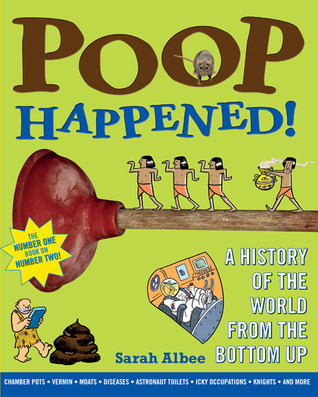 The chapter titles are quite intriguing and eye-catching (especially for young readers who are into the gross, psst, don't tell them that they are actually studying history here ;)): Poop Matters, Bad Plumbing? Bad News, The Origin of Feces, When in Rome, Poo as the Romans do, etc. Each chapter includes brief sections on various aspects of the topic along with sidebars on Hygiene heroes, too much information sections (these tend to be especially appalling), and Icky Occupations. There was a lot of information here about what life really was like during various time periods, including practical things such as how women in hoop skirts managed to go to the bathroom (read the book if you want to know!). This is the sort of history that is left out of the history books but was really important in the lives of those who lived through those times (the sections on disease make this clear). This is a book that will definitely catch the eye of young readers, but only those with a strong stomach should pick it up. In a vast kingdom divided by power-hungry lords, land equals power. With the Nethergrim now awake, her limitless wellspring of evil means opportunity for those willing to do her bidding. One ambitious Lord, eager to overthrow his counterparts and rule the north, succumbs to temptation, helping to let loose the Skeleth, forces of energy that absorb whole anyone who attempts to kill them. In this way the slain end up as slayers, a vicious cycle that never ends. Yet that will not stop young Edmund--an apprentice wizard--and his friends Katherine and Tom, from trying to stop the evil threatening to overtake their kingdom. Together, they team up with the legendary Tristan in a battle of courage, brains, determination, and sacrifice to stop the Skeleth and save the Barony of Elverain from being conquered. According to legend, the knight Tristan and the wizard Vithric had once defeated an ancient evil in an epic battle. Yet now something dark has crept over the village. First animals disappear, then children. Edmund’s brother is among the missing. Now Edmund, with his mediocre skills in spellcraft, must find a way to save his brother’s life. He and his friends set out to battle the monstrous evil and discover their destinies. But what happens when the dark secrets of the past are unveiled? A young boy has his heart set on a brand-new toy fire truck, so he is disappointed when he gets his grandfather's rusty old fire truck, Red, instead. But working together, the boy and his grandfather patch Red right up while Grandpa tells his grandson all about the adventures he had with Red when he was a boy. ​​Mathilda and the Orange Balloon. 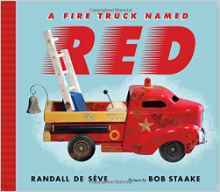 ​Her newest book, A Fire Truck Named Red, illustrated by Bob Staake, is on sale now. 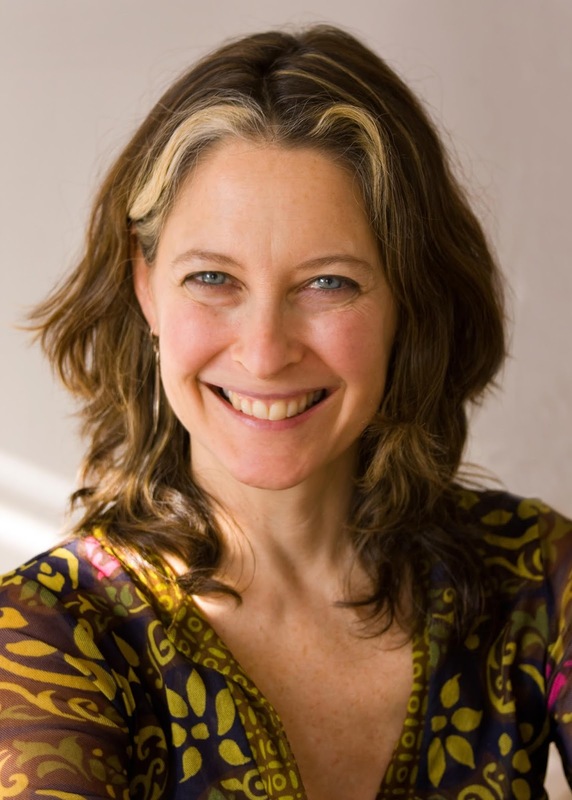 ​She lives in Brooklyn, NY, with her husband, two daughters and a very wicked dog named Henry Biscuit. Learn more about her at randalldeseve.com. De Seve has written a delightful book about the joys of imaginary play as well as the joy of stories shared between generations. Rowan wants a new, fancy fire truck for his birthday, one with a siren that blares, a really tall ladder, and a hose that really shoots water. What he gets: his grandfather's old, battered toy. Naturally he is disappointed. But as his grandfather works at repairing the old toy, he tells Rowan of the adventures he had with Red. At first, Rowan isn't interested in the stories, but slowly he gets drawn in until he imagines himself experiencing the adventures with his grandfather. Not only a fun story about firefighting, a very popular topic with young children, but the sweet underlying relationship that develops between the boy and his grandfather as they bond over childhood imaginings shines through loud and clear. It reminded me of many of my own childhood adventures as well as the ones I see through the eyes of my nephews. Staake's simple illustrations work perfectly to complement the story, as does what is clearly a real old-fashioned toy fire truck. Some things are truly universal and this story reminds me of those things. 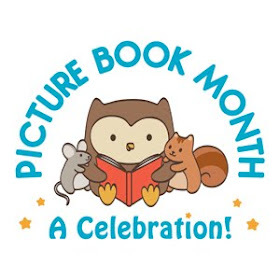 *How did you become picture book author? It’s always good to have an audience in mind (or on hand) when you’re writing. I was a first grade teacher here in Brooklyn for many years, so I wrote for my students. Then, when I took a break from teaching to be with my own young children, I began writing for them. I published my first book when my older daughter was seven. She’s 15 now, and her sister is 10—and I think I’d better get back into the classroom before I forget what makes 6-year-olds giggle! *What do you enjoy about writing for children? For me, it’s all about what happens once the book is published. Reading it to a group of children, watching their little bodies settle into the story, into the imaginary world you’ve created—that’s the big payoff. Imagining that moment is what draws me to my desk and keeps me there when the writing is a struggle. *What's your writing process like? There’s a kind of bubbling up that happens with a new story. It starts as a fizz in my head or my heart and continues to grow until I can’t contain it. That’s when I sit down and begin. Any earlier, before there’s some urgency, and I tend to overwork the idea--and it goes flat. *What's something few people know about you? I once swam with an octopus.